Washington Book Fair a Hit in D.C. 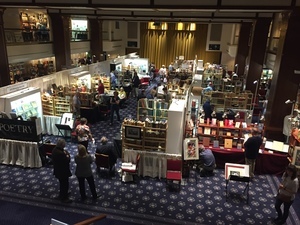 I was eager to get to the Washington Antiquarian Book Fair last weekend to check out its new digs in the heart of downtown D.C. A change of venues is fraught with risk any time a long-established cultural event moves to a new location. I hoped the new spot at the luxurious Sphinx Club and a date change from often bitterly cold March to sunny spring would give the beloved fair a chance to grow even more popular. Old fashioned lovers of old fashioned books like me want the best for 42-year-old WABF. We want events like this to mint ever-bigger numbers of bibliophiles. My fears evaporated the second the elevator doors to the showroom opened and I saw that the locale gave the book fair not only a new look but a new dynamic. A buzz. The electricity in the air felt much more like a rocking book festival than a book fair. The place was stuffed with shoppers carrying carefully wrapped packages of books under their arms as they strolled through a much more open layout that was easier to peruse than the event’s previous site. The old place was divided into many walled up rooms; the new one features two floors that enable people to soak in the wonder of the event and easily find their way back to anything catching their eyes. The Sphinx Club also attracted new kinds of visitors because it sits in a bustling pedestrian-friendly area filled with offices, restaurants, housing and the Metro. Dealers also noted that pushing the event from March to the end of April also paid dividends. It’s often hard to get people to drive to a tricky location in winter with the Mother Nature’s bad habit of dumping snow on the District during or close to the book fair. Shopper Zina Bleck from Hyattsville, Maryland loved the new-look WABF, too. New fans like Bleck and old-hound collectors found plenty to get excited about over the course of the weekend. Gilann Books offered an early draft of Roots by Alex Haley. Bill Hutchinson displayed an eye-grabbing stack of the National Journal editions from the 1820s published by the famed Peter Force. Autographs abounded, from the Founding Fathers to men on the moon. 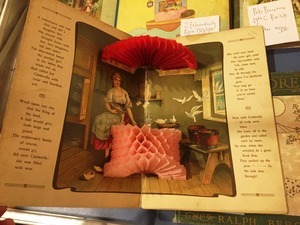 Antique children’s books, beautiful old maps, fine bindings - you name it, WABF had it. I was also thrilled to see that WABF continued to incubate the love of fine books and collections in ways that extend well beyond the actual event. I was a bit shocked to discover that I had lived in the area for a decade and not stumbled across the Washington Rare Book Group. Volunteer Amanda Zimmerman, a librarian at the Library of Congress, happily added names of new people who signed up for announcements about its events. That will generate even more enthusiastic buyers for WABF in 2018 and beyond. WABF Director Beth Campbell hopes the logistics work out for the event to stay in its shiny new downtown home. Campbell was particularly heartened to see that The Sphinx Club made it easier for the District’s young work force to attend. My fears evaporated the second the elevator doors to the showroom opened and I saw that the locale gave the book fair not only a new look but a new dynamic. A buzz. The electricity in the air felt much more like a rocking book festival than a book fair. The place was stuffed with shoppers carrying carefully wrapped packages of books under their arms as they strolled through a much more open layout that was easier to peruse than the event's previous site. The old place was divided into many walled up rooms; the new one features two floors that enable people to soak in the wonder of the event and easily find their way back to anything catching their eyes. Dealers from all over the country raved about the preliminary results. They swapped stories about their joy at selling big ticket items ($4,000 here, $6,000 there) on the first night instead of not being able to make such sales until day two. "The Sphinx Club at 13th and K is a place people know," Paul Collinge of Heartwood Books told me. "I was concerned about attendance because of the move but we've had a good turnout on both days." "As opposed to being in sort-of the suburbs in the past, this is in the heart of the city," another dealer told me as he passed by. "Yesterday (Friday, the first day of WABF), we had a lot of folks who got out of work and came here. The after-work effect was very strong." Dealers also noted that pushing the event from March to the end of April also paid dividends. It's often hard to get people to drive to a tricky location in winter with the Mother Nature's bad habit of dumping snow on the District during or close to the book fair. "I wanted to come here because this is a place you come to find things you can't find anywhere else," she said, while ringing up a heathy tab at the Old Editions Book Shop booth. "It's very friendly here. I don't know everything about rare books and this is a place where dealers explain things." New fans like Bleck and old-hound collectors found plenty to get excited about over the course of the weekend. Gilann Books offered an early draft of Roots by Alex Haley. Bill Hutchinson displayed an eye-grabbing stack of the National Journal editions from the 1820s published by the famed Peter Force. Autographs abounded, from the Founding Fathers to men on the moon. Antique children's books, beautiful old maps, fine bindings - you name it, WABF had it. "We bring book lovers together from all walks of life," she said. "We have monthly events, curator-lead tours and do as much as we can to promote the love of books in this region." "I think this has gone over very well," she shared with me. "It has been a lot busier than last year's fair. The visibility in the city is great. We attracted a lot of impulse buyers, which is something we never really had before." Campbell was particularly heartened to see that The Sphinx Club made it easier for the District's young work force to attend. "We saw a lot of younger people," she said. "These lovely Millennials are the generation that's going to take care of all this stuff. We're turning the corner getting the next generation involved and it renews my faith to see them getting interested."